Welcome to this month’s Secret Recipe club! Every month I look forward to my assignment for the Secret Recipe Club and I’m always excited to go and scour for a recipe. This month I was assigned C Mom Cook. I was excited to see I was assigned Shelley’s blog! Shelley and I met each other through the SRC and found out we don’t live too far from each other – small world! I’m envious of Shelley’s bread making skills and knew I wanted to make something with homemade dough. I would have loved to make one of her many sourdough recipes or chocolate brioche buns. 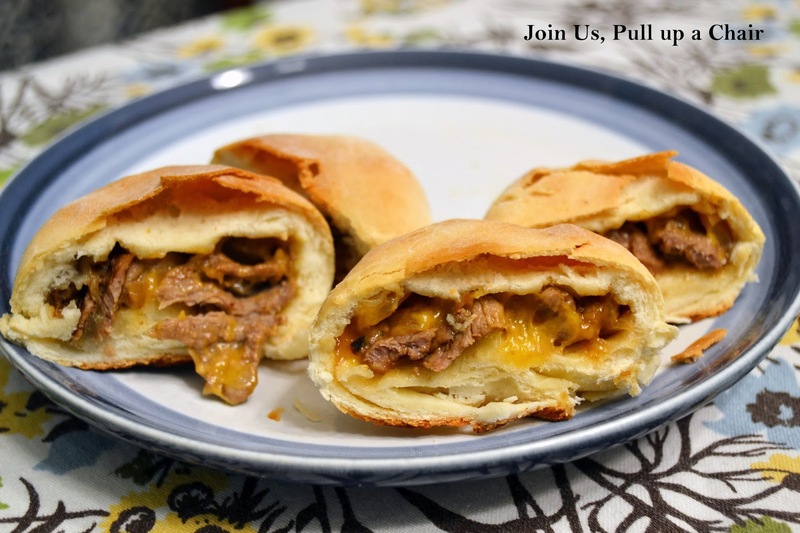 I knew this month was going to limited on time and settled on her recipe for cheesesteak buns. Since we’re both close to Philly, I figured it would be a great way to celebrate one of the famous foods of the area. I whipped these together and I loved how quick and easy they were to make. They were great for dinner and perfect for lunch leftovers the next day. The best part…I had some leftover dough and made dessert ones with caramelized bananas. YUM! Once your milk has been scaled, add in the sugar, oil and salt. Let this mixture cool until it’s lukewarm (about 105-110 degrees). Add in the yeast and allow it to sit until the yeast is activated and becomes frothy, about 10-15 minutes. Sift the flour into a large bowl and then add the milk/yeast mixture. Using a stand mixer with a dough hook attached, combine the flour and wet mixture and knead using the mixture until the dough has formed into a ball. Leave the dough in the bowl and lightly spray with cooking spray and cover the bowl with a damp cloth. Allow to rise until it doubles in size – about 1 to 2 hours. Heat the olive oil over a large skillet and add in the onions. Cook the onions until they start to caramelize. Break the meat into small pieces and add into the pan. Constantly move the steak pieces around the pan until it’s cooked through. Sprinkle with shredded cheese, cover the pan and remove from the heat. Once the dough has doubled in size, deflate it and divide it into 16 pieces. Roll each portion into a round ball. Using a rolling pin, roll the dough into a circle approximately two inches in diameter. Using your hands, gently pull the edges to make the circle large closer to three inches in diameter. Line a baking sheet with parchment paper and set aside. Place a heaping tablespoon of the filling into the middle of the dough. Gather the edges of the dough and seal the bun. Place each bun on the prepared baking sheet and bake at 400 for 15 minutes until they turn golden brown.